In most cases, taking one point from two matches in a week doesn’t earn praise. Despite their 1-0 loss in Rochester and the 1-1 home draw against Saint Louis FC, however, praise is exactly what the boys from Bethlehem deserve. The Steel secured their first ever postseason appearance. The USL side isn’t our “players of the week” because of their middling results on Tuesday and Sunday. They are our “players of the week” to recognize the culmination of a successful season. In only their second year of existence (in this iteration), the Steel will get their first taste of the playoffs— or, as some of you might point out, one less than the Union have had in their history. The road won’t be easy, and it is unlikely Bethlehem will be the first team in the organization to win a playoff round. The Steel had a chance to finish as high as 6th in the conference but failed two win either of their two games this week. Instead, they finished 8th and face Eastern Conference-leading juggernaut Louisville City FC in the first round Friday evening. Louisville have been dominant. Only Real Monarchs SLC of the Western Conference finished with more than City’s 62 points. There is hope, though, for the underdogs. Bethlehem last traveled to Louisville Slugger Field on Sep. 15 and secured a 2-2 draw. While the Steel didn’t necessarily shine this week, there is one player worth mentioning for his performance. Bethlehem left back Matthew Real scored the first goal of his professional career against St. Louis. The 18-year-old cut inside from the flank and beat the goalkeeper to the near post. 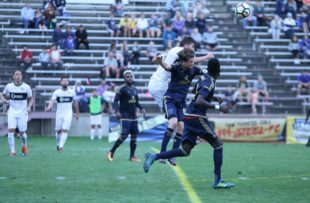 He is one of the many promising young talents who have performed well at Goodman Stadium this season, hoping for the same opportunity at Talen Energy Stadium in the future. Then there are Auston Trusty and Adam Najem, who are a little closer to wearing the blue and gold. Santi Moar and Chris Nanco have flourished on the wings. Cory Burke and Seku Conneh have been dangerous in attack. And then there is captain James Chambers, the glue that holds together the midfield. On the touchline there is head coach Brendan Burke. It’s not easy navigating the waters of the USL while meeting the demands of the “head” club. Cincinnati and Louisville don’t have to worry about their best players being called away at any moment. They don’t have to allocate 30 minutes here and there to guys rehabbing injuries. Burke has done all of this and still managed to steer his club to the postseason. The Steel may be playing their last game of the season on Friday at 7:30 pm. Check it out. After another difficult soccer season in Philadelphia, at least Bethlehem gave us a reason to smile. If Curtin put his money where his mouth is Wij would be starter next year with Real starting to get spot starts. Brendan Burke does not have to worry about his players being called up, because they are not rostered to MLS. The uncertainty, and Nick Fishman is absolutely totally 100% correct that it is considerable, is what MLS rostered players will be sent down to get game minutes. While there has never been any official comment on the subject, behavior strongly, powerfully and clearly suggests that if a Union-rostered player is present, he will start. That circumstances is as disruptive as having your players called away. It is to the entire organization’s credit that first-team players do not view being sent to the Steel for minutes as demotions, and it is to Brendan Burke and his staff’s that they have figured out a way to turn a potential morale killer into a team strength by having the away games be the opportunity for his character boys to prove their worth.